This profile is based on a copy of General der Panzertruppe von Vaerst’s microfilmed service record housed at the United States National Archives and Records Administration in Washington, D.C. As the service record covered only the period from 1912-1935, supplemental sources (see below) were consulted for the remainder of von Vaerst’s military career. Parents: Gustav and Emmeline (née Hack) von Vaerst. Wife: Married Astor Freiin von Swaine on 30 August 1925 in Obertheres am Main – one son and three daughters. Easter 1903-1907: Attended Gymnasium (High School) in Meiningen. June 1907-1908: Attended Realgymnasium in Meiningen. July 1908-13 July 1912: Attended Realgymnasium in München; attained his certificate of graduation from that institution. 15 July 1912: Entered the Army as a Fahnenjunker in Husaren-Regiment Landgraf Friedrich III von Hessen-Homburg (2. Kurhessisches) Nr.14. 3 August 1914: In the field with Hussar Regiment 14 and detached as an Ordnance Officer to the 22nd Cavalry Brigade. 1 December 1914: Returned to Hussar Regiment 14. 1 April 1915: Detached as an Ordnance Officer to the 22nd Cavalry Brigade. 26 May 1916: Returned to Hussar Regiment 14. 8 June 1916-27 August 1916: Deputy Regimental Adjutant of Hussar Regiment 14. 2 November 1916-27 December 1916: Deputy Regimental Adjutant of Hussar Regiment 14. 18 February 1917-25 February 1917: Detached to a course with Assault Battalion 4. 10 April 1917-20 September 1917: Deputy Regimental Adjutant of Hussar Regiment 14. 21 September 1917: Regimental Adjutant of Hussar Regiment 14. 5 August 1918: Detached as Deputy Adjutant to the staff of the 22nd Cavalry Brigade. 11 November 1918: Returned to Hussar Regiment 14 and delegated with the leadership of the 3rd Squadron. 28 February 1919: Delegated with the leadership of the 2nd Squadron of Volunteer Hussar Regiment Hessen-Homburg. 1 November 1919: Transferred to Reichswehr Cavalry Regiment 11. 1 April 1920: Transferred to the 16th Reiter [Mounted]-Regiment. 3 January 1921: Detached to Wehrkreis [Military District] Command VII in München for training as an Officer for Special Employment. 20 June 1922-31 July 1922: Detached to the II. Battalion of the 21st (Bavarian) Infantry Regiment. 1 October 1922: Relieved of his command to the staff of the 7th Division. 1 October 1924: Leader of the Machinegun Platoon of the 16th Reiter-Regiment. 30 September 1924-23 October 1924: Detached to a machinegun course at Sennelager. 1 October 1925: Chief of the 6th Squadron of the 16th Reiter-Regiment. 15 July 1927-15 August 1927: Detached to a course promoting standardized riding training at Hannover. 4-23 March 1929: Detached to the Course for Physical Education at Wünsdorf. 1 October 1929: Chief of the 3rd Squadron of the 16th Reiter-Regiment. 6 December 1929: Saber of Honor for good shooting with the carbine. 5-19 September 1930: Detached to the Hungarian Army. 1-7 October 1930: Detached to a cavalry course at Neuhammer. 1 November 1930: Transferred to the staff of the 1st Cavalry Division. 3 December 1930: Message of greeting from the Chief of the Army Command (General der Infanterie Kurt Freiherr von Hammerstein-Equord) for good shooting with the carbine. 1 July 1933: Detached to the Cavalry School at Hannover. 1 January 1935: Transferred to the Hannover War School. 20 January 1938: Commander of Schützen [Rifle]-Regiment 2 of the 2nd Panzer Division. 1 June 1941-8 December 1941: Although his exact duty status during this period is not known, it appears from the evaluation cited above that Oberst/Generalmajor von Vaerst was serving at the School for Mobile Troops at Krampnitz for at least a part of the time. 9 December 1941-12 December 1942: Delegated with the leadership of the 15th Panzer Division in North Africa. 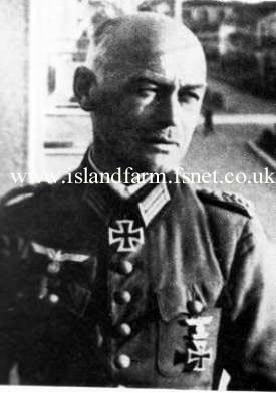 12 December 1942-26 May 1942: Commander of the 15th Panzer Division in North Africa. 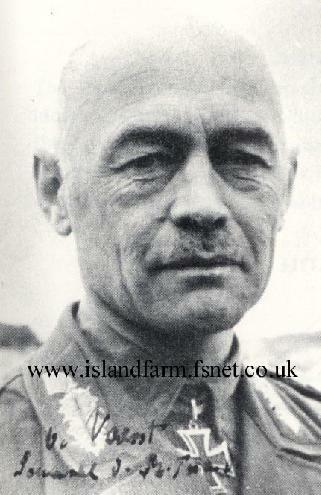 8 July 1942-31 August 1942: Again, Commander of the 15th Panzer Division in North Africa. 17 September 1942-11 November 1942: Again, Commander of the 15th Panzer Division in North Africa. 11 November 1942: On sick leave. 28 February 1943-9 May 1943: Commander-in-Chief of the 5th Panzer Army in North Africa. 16 May 1943 - transferred to Trent Park Camp 11 sorting camp. 1 June 1943 - departure from Trent Park Camp 11 sorting camp to unknown camp. Knight’s Cross of the Iron Cross: 30 July 1940, Oberst, Commander of the 2nd Schützen-Brigade. Prussian Iron Cross, 1st Class (1914): 24 December 1916. Prussian Iron Cross, 2nd Class (1914): 25 September 1914. Saxe-Meiningen Cross for Merit in War: 30 May 1915. Schaumburg-Lippe Cross for Faithful Service: 29 November 1914. NOTE: Based on his service in World War II, it would seem probable that General der Panzertruppe von Vaerst was a recipient of the following decorations: Panzer Assault Badge in Bronze or Silver; Wound Badge in Black (for wounds received on 26 May 1942); and the “AFRIKA” Campaign Cuff-Title. However, no photographic or documentary evidence has been seen to support this assumption. 6-18 August 1914: Engagement against the Othain and Ciers Districts and reconnaissance in force at Fillen. 22-27 August 1914: Battle of Longwy – Longuyon and the Othain District. 28 August 1914-1 September 1914: Battle of the Maas River crossings. 2-3 September 1914: Battle of Varennes – Montfaucon. 4-5 September 1914: Pursuit west of Verdun and through the Argonne. 7-11 September 1914: Battle on the Rhine-Marne canal. 4-6 October 1914: Engagement before Lille. 8-15 October 1914: Engagement at St. Jans Cappel – Metern – Berquin – Estaires. 15-28 October 1914: Battle of Lille. 13 October-13 December 1914: Positional combat in Flanders and Artois. 3-21 April 1915: Positional combat between Augustow, Mariampol and Pilwizki. 26 April 1915-29 May 1915: Advance against Lithuania and Courland. 28 April 1915: Engagement at Kielmy. 30 April 1915: Engagement at Schaulen. 2 May 1915: Engagement at Skaiskiry and Janisehky. 4-9 May 1915: Advance against Kieidany. 5 May 1915: Engagement at Beisagola. 7 May 1915-13 July 1915: Engagement on the lower Bubissa. 9-15 May 1915: Engagement at Schaulen. 19-26 May 1915: Engagement at Rossanie. 27 May 1915-4 June 1915: Engagement at Sawdiniky and Podubis. 4-7 June 1915: Engagement at Cytowiany. 6-7 June 1915: Engagement at Bubice. 8-9 June 1915: Engagement at Jlgize. 10-26 June 1915: Engagement at Zoginie and on the Bagno-Terule. 14-25 July 1915: Battle of Schaulen. 30 July 1915-7 August 1915: Battle of Kupischki. 3-10 August 1915: Engagement at Kowarsk and Willkomierz. 19 August 1915-8 September 1915: Niemen Battle. 9 September 1915-2 October 1915: Battle of Vilna. 1 January 1916-10 August 1916: Positional combat between Krewo – Smorgen – Lake Narotsch. 25 August 1916-21 November 1916: Positional combat west of Brody. 9-20 December 1916: Combat pursuit to Jalomita – Prahova – Buzaul. 9 January 1917-24 February 1917: Border defense on the Belgian-Holland border. 16 March 1917-7 April 1917: Combat before the “Siegfried” Front. 29 June 1917-9 September 1917: Border defense on the Belgian-Holland border. 14 September 1917-20 October 1917: Positional combat on the upper Styr and Stokhod Rivers. 3 December 1917-16 February 1918: In the War Zone on the Stokhod River during the cessation of hostilities. 19 February 1918-15 November 1918: Combat in support of the Ukraine. 16 November 1918-14 January 1919: Evacuation of the Ukraine. 15 January 1919-20 February 1919: Border and railway protection in Bialystock. 21 February 1919: Evacuation home. Bender, Roger James & Law, Richard D. Uniforms, Organization and History of the Afrika Korps. R. James Bender Publishing, San Jose, California, USA, 1973. Bender, Roger James & Odegard, Warren W. Uniforms, Organization and History of the Panzertruppe. R. James Bender Publishing, San Jose, California, 1980.